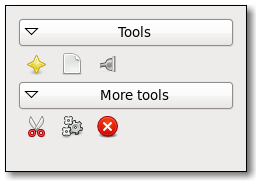 GtkToolPalette implements AtkImplementorIface, GtkBuildable and GtkOrientable. Size of icons in this tool palette. Whether the icon-size property has been set. Style of items in the tool palette. Whether the item group should be the only expanded at a given time. Whether the item group should receive extra space when the palette grows.